Ideal for use when working in poorly lit areas. These lights give a bright illumination and dont take up much space making them ideal to use in cupbaords, tents or even work areas. 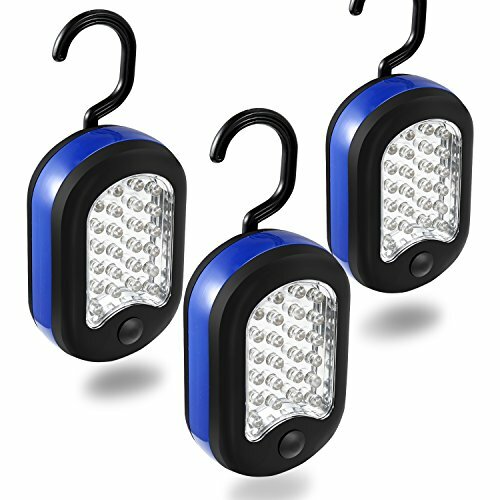 The magnet and hook on the back of these lights allows you to hang or connect them so that your hands are free and with the simple on/off push button allows for quick and easy operation. INSTANTLY IMPROVE YOUR VISIBILITY WITH HANDSFREE, BRIGHT LIGHTING - Why fumble around in the dark while you tackle household projects, fix things or clean things up? Think how much easier home or outdoor activities at night would be with bright light and two free hands. YOUR UP-CLOSE, DETAIL WORK IS NOW A BREEZE - Wouldn't it be nice to have bright, dependable light shining right where you need it? The 360° rotatable hook for hanging, magnet on back, and the flat sides allow you to focus light where you need it! SUPER BRIGHT, COMPACT & DURABLE - Why equip yourself with anything but the best and most compact work light? 27 LEDs unleash a blazing 50 lumens of clean light. Equipped, the flashlight's light output is no joke. If you have any questions about this product by CALIFORNIA CADE ELECTRONIC, contact us by completing and submitting the form below. If you are looking for a specif part number, please include it with your message.